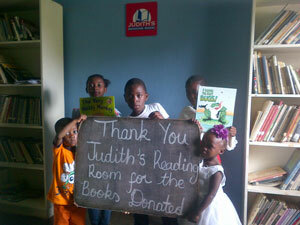 November 29, 2016 — Lehigh Valley, Pa. Judith’s Reading Room, a local literacy nonprofit organization founded in 2010 announced today that it opened its 95th library in the world in its 18th country. 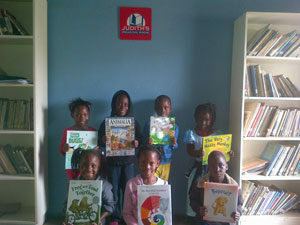 The Mukwashi Trust School, serving 385 children in grades Pre-K through 9th, near Lusaka, Zambia is the latest recipient of a custom, hand-picked collection of outstanding children’s literature. Judith’s Reading Room sponsors the annual $10,000 Freedom Through Literacy Award open to teachers, librarians, authors, booksellers, non-profit literacy organizations and educators — in a word, anyone in the world who has done exemplary work to instill in others a love of reading. Click here for the online application the 2017 Freedom Through Literacy Award. Deadline for applying is July 7, 2017. The Judith’s Reading Room library at Mukwashi Trust School is dedicated in the memory of Nancy Kasso, sister of the co-founders of Judith’s Reading Room. Nancy was an avid animal lover and tireless volunteer who dedicated her life to making and preserving beautiful things. Judith’s Reading Room has eponymous libraries in 18 countries containing a total of 127,179 books valued at nearly $1.4 million dollars. The organization is dedicated to building connections and relationships around the world through adult and children’s literature.